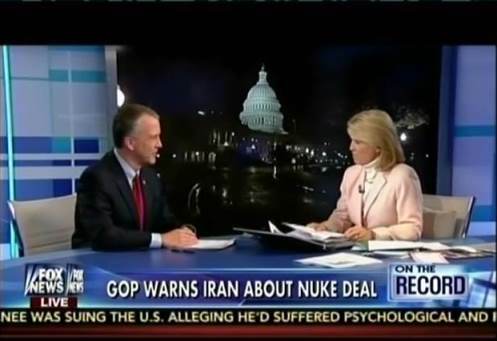 Last night Alaska’s newly elected Senator Dan Sullivan appeared on FOX News’ Greta Van Susteren program to explain why he and some 46 other members of the Senate wrote an open letter to Iran's leaders on Monday stating that any nuclear deal needs congressional approval in order to last beyond President Obama's term. The stark letter, aimed at re-asserting lawmakers' role as talks near a key deadline, pointed out that without congressional approval on a deal, all Tehran would be left with is a "mere executive agreement" between President Obama and Ayatollah Ali Khamenei. If the Senate is part of one of the three coequal branches of government isn’t it time Republicans, and those Democrats who still have some allegiance to the idea that the United States is a constitutional republic, stood on their own and exercised the power the Constitution grants their branch of government? Our friend Andy McCarthy has suggested if Senators are serious about exerting the constitutional power of the legislative branch they should move from writing this letter to actually legislating; in this case passing a “Sense of the Senate” resolution regarding Obama’s obligations under the Constitution. What should such a “Sense of the Senate” resolution say? We would add to the language McCarthy has suggested a reminder that Congress controls the purse strings and that no funds would be appropriated for the implementation of such an agreement, but given the Republican Congress’ record on carrying through on such a threat it would probably only embolden the Iranians. While McCarthy goes on to make an extensive, and very potent, international law argument (which you can read here) our concern is more political. Obama has no plans to submit this treaty to the Senate because he knows he would lose; it would never get two-thirds, in fact it is likely two-thirds might very well vote against it if it is as bad as Israeli Prime Minister Benjamin Netanyahu suggested in his speech to Congress last week. Beyond the “take Obama to court” suggestion, the politicization of the treaty process is what seemed to bother Greta the most, and frankly we think that’s where she got it most wrong. Our fight against Islamism isn’t limited to the air war against ISIS, that's the battle, as Prime Minister Netanyahu said, and the fight against islamism in Iran is the war. This shouldn't be Republican vs Democrat fight; it is a fight between those who are for protecting our government of constitutional liberty vs those who are trying to subvert it. In this fight there is no compromise, only the victory or defeat of freedom. Americans should know who is on which side. To us who signed the letter Republicans sent to Teheran and a vote on a “Sense of the Senate” resolution would be conclusive indicators of where individual Senators stand in this battle. We urge you to call your Senator (the Capitol Switchboard is 1-866-220-0044) tell him or her that you want the Senate to demand a vote on any nuclear deal with Iran and that you demand the Senate reject any agreement that puts Iran on course to acquire nuclear weapons. Submitted by alohalori2u on Tue, 03/10/2015 - 14:39. I disagree with Greta as well. The Senate is inserting itself into this very serious issue I believe, because Senators know they will never be properly represented by Obama, so they now feel compelled to become a relevant voice in this process? We have no time to take this to court as Greta suggests? Iran becomes more emboldened by the day, simulating the destruction of a U.S. destroyer, amassing troops near Israeli border? The Senate has every right to intervene into Iran talks on its own, which they know Obama will enter into very unadvisedly! Greta needs to wise up & support this action!